With Drago, we come to the end of Book One in the star chart. Think of it this way — we have divided the Zodiac into three parts — or books — with each Book containing four of the constellations and all their decans. This first book examines the Redeemer’s first coming as a suffering Savior. Sagittarius and all of his decans have represented to us the fulfillment of that promise. With Drago, we see the final end of the enemy. Notice that Drago’s head is being crushed by Hercules. We have already discussed that Herculesrepresents Jesus Christ. You can check out the page on Hercules for more information. Now there is something that is absolutely fascinating that must be pointed out! 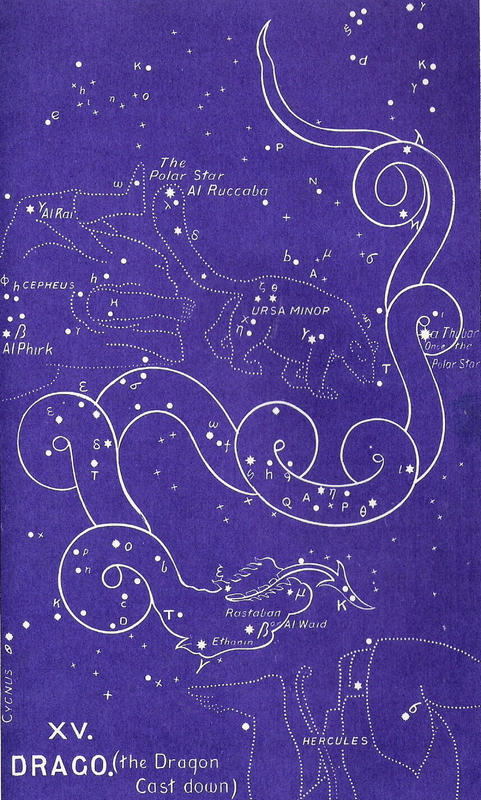 When the star chart was first drawn, the north star (the star directly above the North Pole) was one of the stars inside the coils of this dragon, Drago. Think of the spiritual applictions of that fact. At that time, Satan was indeed the Prince of the world, and the world revolved around his plans. But now, the pole star has shifted to one in the “Little Bear” or Ursa Minor; and as we will see later, Ursa Minorrepresents the little nation of Israel! In this age of God’s grace poured out on mankind through the death and resurrection of Jesus Christ, world events pivot on God’s dealings with this little country. Always keep your eyes on Jerusalem! It is in that conflicted city that God’s activities in man’s affairs will become suddenly the central focus of all the dreams and hopes of mankind. What an interesting harmony between present-day events and this ancient Zodiac. This is a picture of a dragon (looks more like a snake!) being stepped on by Hercules, the end result being its demise. It can no longer threaten the Beloved. Notice that Hercules is kneeling as though one of his heels has been bruised — again, a pictoral representation of Genesis 3:15. In Greek mythology, this is the monster that guarded the golden apples of Hesperides. In order to recover these precious fruits, Hercules entered into a desperate conflict and was the eventual winner. In another myth, this is the monster that guarded the sacred spring and was killed by Cadmus of Thrace. In order to win this fight, Cadmus plucked out the teeth of the dragon. It’s interesting to suppose that the kernel truths in these myths would be that this Drago was, in reality, the snake that stole the access that Adam and Eve were granted to the Tree of Life and the Living Waters of the Garden of Eden. In order to restore these precious treasures of grace, the Lord Jesus entered into a desperate battle with Satan (Drago) and destroyed him and his chief weapon — death! As so we come to the end of this first Book. Here is the enemy, destroyed by the One who came, crushing its head under foot and recovering the treasure that once was lost. The fruit of the Tree of Life is once again freely offered to men. The fear of death is plucked clean of its power over men. Everything that needed to be done for mankind — which mankind could not do for itself — has been done by the Lord Jesus Christ. 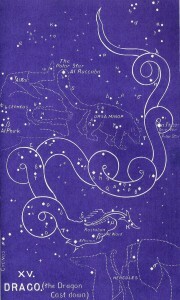 To continue in the correct order of the ancient star chart, please select Capricornus next.